If you have decided to buy a new clothes dryer then the first decision you need to make is natural gas or electric. Electric dryers typically cost about $50-$100 less initially, but require a 240 volt outlet and will normally cost more to operate depending on your electric rate. Gas dryers require a gas hookup and a standard 120 volt outlet, plus they may cost more to install since installation by a professional is recommended. For this review we are going to look at the best gas dryers. You also need to know how much space you have in your laundry room for your washer and dryer. Full size dryers are up to 29 inches wide, however if you are limited in floor space there there are stackable units which stack vertically directly onto the washing machine with the help of an additional stacking kit and compact varieties that are 24 inches or less. We looked at dozens of models and in addition to all the features we mentioned we also factored in price and other user/consumer ratings to come up with our list of the top 10 best gas dryers which we review below. We also have a spec comparison chart at the bottom of this article. We selected the LG DLGX9001V as the best gas dryer. It is the most expensive gas dryer on our list as well at about $1298 on sale. This 9 cubic foot capacity unit has lots of extra features you won’t find on cheaper models. It starts with the door which is contoured, angled, and elevated to make loading and unloading easier. Modes include TurboSteam to quickly reduce wrinkles, Sensor Dry system which monitors moisture levels and automatically changes the drying time, and SteamSanitary cycle which lets you use steam to sanitize items that are marked as non-washable like kid’s toys or throw pillows. We could find no major flaws with the LG DLGX9001V, although it does take up a lot of space and it is not stackable. 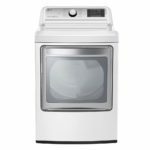 Overall if you are willing to pay up for excellent drying performance with lots of features than the LG DLGX9001V is a good choice for you. 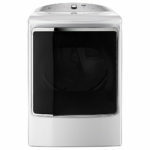 We think the best gas dryer under $1000 is the LG DLGX7601WE which you can find on sale for around $898 This LG Steamdryer with 7.3 cu. ft. of capacity received the highest score from the leading consumer magazine primarily thanks to its outstanding drying ability no matter the load size. Some other features include a SteamFresh cycle which reduces wrinkles and refreshes clothes in just 20 minutes and a SteamSanitary cycle which lets you sanitize pillows, toys, or other delicates. 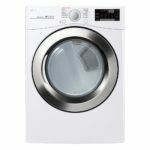 The LG DLGX7601WE doesn’t really have any weaknesses although there are larger capacity models available, while there are also some dryers that are cheaper that are still quite good. 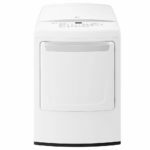 The matching washing machine is the LG WT7600HWA. The $1149 Kenmore Elite 71632 is another worthy model. This gas dryer has the largest capacity on our list at 9.2 cubic feet of laundry and rates highly due to excellent drying performance and very quiet operation. Features include SmartDry technology to measure moisture levels and adjust cycle time and heat so you will get dry clothes without damaging the fabrics, Quad baffles which forces clothes to open up more when tumbling, and Steam Refresh to reduce wrinkles and minimize odors. The main drawback to the Kenmore Elite 71632 is that it is large and not stackable which means you need lots of space to store it. Although performance wise, there are no complaints. The matching washing machine is the Kenmore 28132. 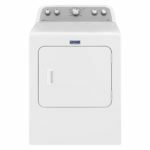 The $988 LG DLGX3701W is our highest rated gas dryer that is also stackable. It combines very good drying performance with lots of features. It has 12 drying cycles including a steam cycle and a sensor dry system, 5 temperature settings, 7.4 cu. ft. of capacity, and smart technology that lets you access features from your phone and works with Google Assistant and Amazon Alexa. 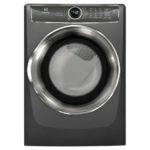 Overall the LG DLGX3701W is a solid dryer, however there are cheaper options available if you don’t need ‘smart’ features. The matching washing machine is the LG WM3700HWA. The LG DLG3501W is very similar to the LG DLGX3701W, but has less features and a cheaper price of $898. This stackable unit has 7.4 cubic feet of capacity, 10 drying cycles, 3 temperature settings, and Wi-Fi connectivity for smart technology. The LG DLG3501W does not have a steam function, but it does have a reversible swing door which might come in handy for some people. The matching washing machine is the LG WM3500CW. One of the best overall values in terms of balance between price, performance, and build quality is the $748 Whirlpool WGD75HEFW. It doesn’t wow you in any one area, but offers solid drying performance and all the important features, except for a steam mode. The Whirlpool WGD75HEFW has 7.4 cu. ft. of capacity, moisture sensor, temperature control, and a wrinle shield option. Overall this is a great choice for anyone looking for a quality gas dryer for not too much money. The $698 Samsung DV42H5000GW rates highly in terms of overall drying performance, convenience, and noise levels. This 7.5 cubic feet capacity dryer has 9 preset cycles including sensor dry with 4 temperature settings and 4 dryness levels. The Samsung DV42H5000GW does not have a steam setting. Despite that one negative, we still really like the Samsung DV42H5000GW at this price point since it is the best below $700. The matching washing machine is the Samsung WF42H5000AW. 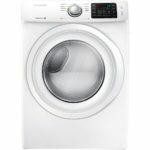 The Electrolux EFMG627UTT gas dryer does not quite match up to the performance of its matching washing machine which we rated very highly, but it is still a decent performing dryer. Selling for $1098, we feel there are better machines for less money with the main weakness being that it just simply takes too long to dry clothes. On the upside the Electrolux EFMG627UTT looks beautiful, has a large 8 cubic feet of capacity, and is stackable. It also has a lot of special cycles including an Instant Refresh cycle which uses steam to quickly remove wrinkles and refresh fabrics in just 10 minutes. 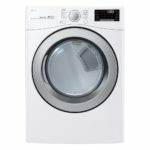 The cheapest gas dryer to make our list is the LG DLG1502W which sells for $598. The overall drying performance doesn’t quite match up to more expensive models, but is still quite good and it also has a quiet operation. 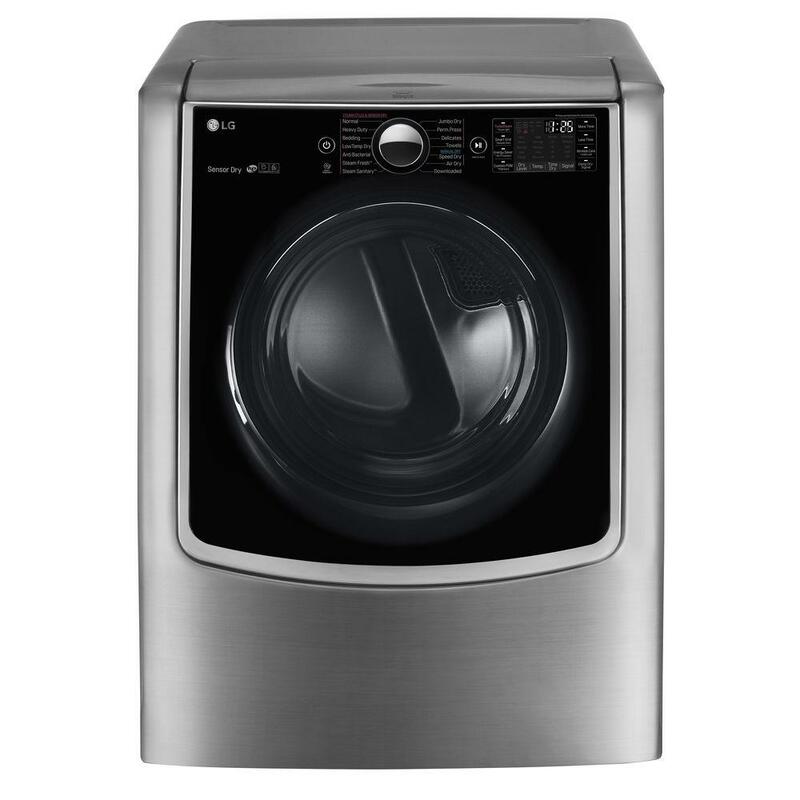 The LG DLG1502W doesn’t have a ton of features, but it does have 8 drying programs with a moisture sensor, 5 temperature settings, and NFC technology which lets you download new cycles and diagnose problems directly from your smart phone. On the downside it is not stackable and it is lacking a steam option. 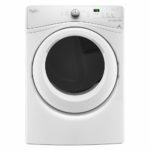 The folks over at thewirecutter.com picked the $648 Maytag MGDX655DW as their best dryer. The thinking is that most dryers all work roughly the same, so it is better to get a model that is simple, well-built, has a good reputation for reliability. This unit has a capacity of 7 cu. ft. and a moisture sensor which will get your loads dried evenly no matter the size of the load. The Maytag MGDX655DW doesn’t have any extras like Wi-Fi or a steam cycle which saves you some money. Overall this model is a good choice for anyone looking for a quality, long-lasting budget gas dryer.